Corpus Scriptorum Christianorum Orientalium was started in 1903 by Jean Baptiste Chabot, an eminent Syriacist who had received his training at the College de France. With Chabot, four other Orientalist scholars participated in the early work and publication of the C.S.C.O. : Baron Carra de Vaux, Louis Cheikho, S.J., Ignazio Guidi, and Henri Hyvernat. The C.S.C.O. makes available critical editions and modern translations of the works of the eastern fathers of the church (e.g. Ephraem the Syrian, Cyril of Alexandria, and Jacob of Serug); these include many commentaries on Scripture. In 1912 Henri Hyvernat drafted a proposal stating that The Catholic Universities of America and Louvain should assume responsibility for publishing the C.S.C.O. It was approved that same year by the rectors of both the universities. The American bishops responded with letters of congratulations and good wishes to the Universities. 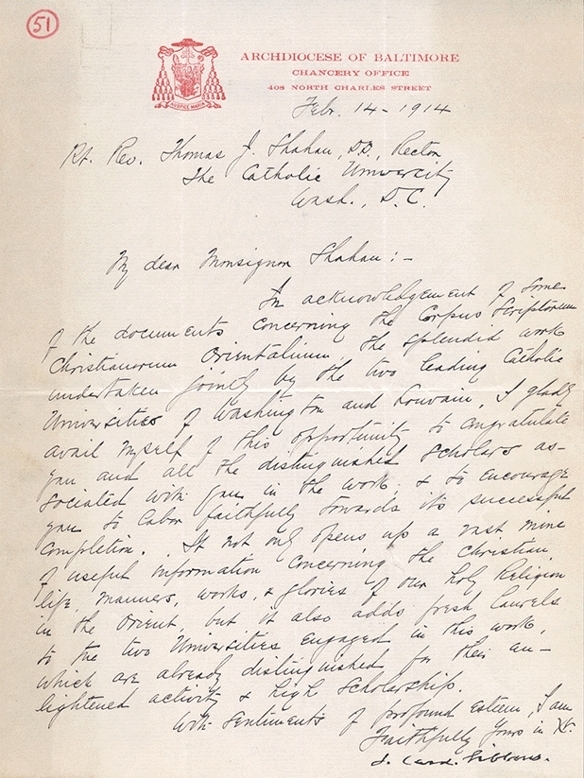 See below for a transcription of the Cardinal Gibbons’ letter displayed on the right. In acknowledgment of some of the documents concerning the Corpus Scriptorum Christianorum Orientalium, the splendid work undertaken jointly by the two leading Catholic Universities of Washington and Louvain, I gladly avail myself of this opportunity to congratulate you and all the distinguished scholars associated with you in the work and to encourage you to labor faithfully towards its successful completion. 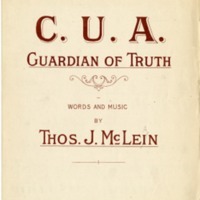 It not only opens up a vast mine of useful information concerning the Christian life, manners, works, and glories of our holy Religion in the Orient, but it also adds fresh laurels to the two Universities engaged in this work, which are already distinguished for their en-lightened activity and high scholarship.